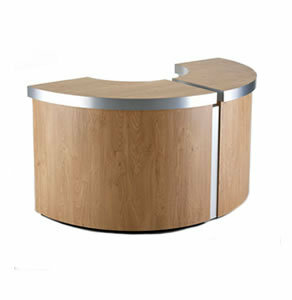 REM Helix Reception Desk is a modular desk which can be arranged to suit your salon. The Helix Desk shown in the image, is made up from two helix curved sections shown in light Winchester Oak with alu brosse trim. The Helix Reception Desk, you can pick all one colour or have it trimmed in a contrasting colour in any laminate or laminates from the REM range(please use the drop down boxes to choose your laminate colours).Helix Curved Section Sizes width 86cm, height 93cm, depth 86cm. Helix Straight Section Sizes width 70cm, height 93cm, depth 48cm. Please ring 01270 630280 for help to plan this item for your salon.